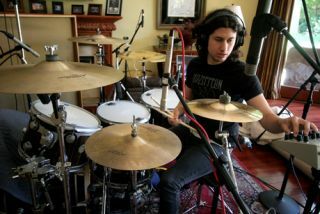 Ilan Rubin, whose drum credits of course include Nine Inch Nails and Lost Prophets, has been hard and work creating not just some awesome new tracks, but also a cool new promo video. Take a look inside to see for yourself. The clip shows the multi-talented instrumentalist jamming through new track 'Remission Of Guilt'. The song is being released under Ilan's The New Regime project. Of 'Remission of Guilt', Ilan says: "I came up with the initial idea for this song at about the halfway point of completing the second album. Since I had a precise vision as to what I wanted the album to be, I finished the idea for this song and recorded it almost immediately after the album was done. "'Remission of Guilt' is probably the most aggressive of all the New Regime material to date but still retains the clarity of melody, the detail of harmony and structure, and the execution of musicianship."